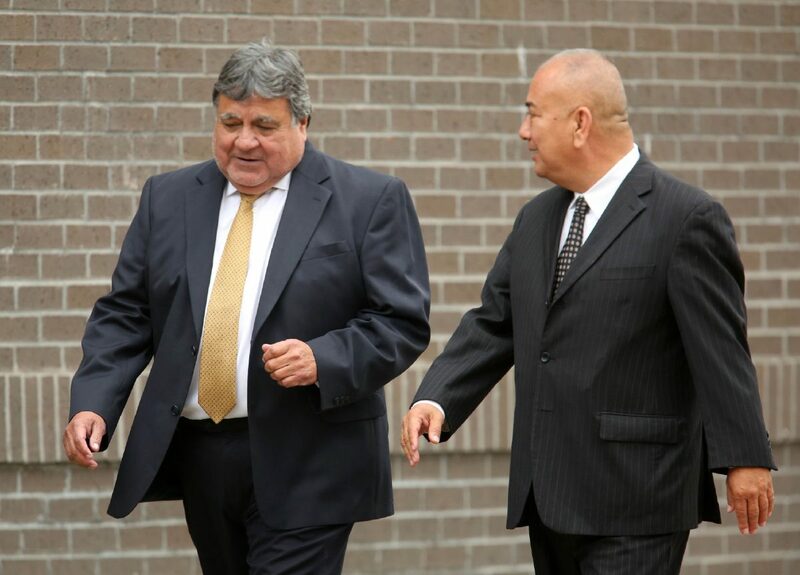 McALLEN — A motion was filed Thursday to replace the lead attorney representing a state district judge in a federal bribery case, action which came soon after the government alleged a conflict of interest against the counsel. Less than a month after two local attorneys were hired to represent District Judge Rodolfo “Rudy” Delgado, the motion in question now seeks to have a San Antonio-based attorney replace them, according to court records. On Wednesday, federal prosecutors had asked the court to strike a venue change motion filed by Adolfo “Al” Alvarez, who was hired the night federal agents arrested Delgado on Feb. 2. Thursday’s filing seeks to replace both Alvarez and his co-counsel, attorney Fernando G. Mancias, with San Antonio-based attorney Michael W. McCrum. McCrum, who has been practicing law in the state for more than 30 years and specializes in criminal law, was lead counsel for state Sen. Carlos Uresti in a federal fraud trial in San Antonio. The motion for McCrum to take over as Delgado’s counsel, which the government will not oppose, came a day after the government brought up a potential conflict of interest with Alvarez’s representation of Delgado. “Undersigned counsel communicated with Assistant United States Attorney Julie Searle and she indicated that the government does not object to the motion for substitution,” the court record states. In its filing Wednesday, the government asked the court to resolve what it believed was a conflict of interest involving Alvarez, citing the very venue change motion filed by Alvarez on Delgado’s behalf last week. Delgado had also retained Mancias, who stood before the magistrate for Delgado’s initial hearing on Feb. 5, court records show. The government cited four different instances where they made Alvarez aware of a potential conflict of interest in his capacity as counsel for Delgado, beginning with the defendant’s initial appearance hearing on Feb. 5. Despite this, Alvarez filed a notice with the court that he would be lead counsel for Delgado. The record lists additional notifications by the government to defense counsel on Feb. 6, 15 and 16. The government responded to Delgado’s motion for a venue change, in which the judge argued his rights were being violated as a result of the government filing the case out of Houston as opposed to McAllen, the location of the alleged offenses. In that motion filed last Wednesday, Alvarez argued the government’s filing was strategic. Federal prosecutors allege that Delgado accepted bribes from at least one attorney in exchange for favorable consideration. This allegedly began in November 2016 until about late January 2018. The government in its filing Wednesday argued Delgado has no constitutional right to have the case tried in McAllen, and that it had met its obligation by holding the case in Houston, which is within the district. “ … The Sixth Amendment only provides that the trial shall take place within the judicial district where the crime was committed,” the court record states. Federal prosecutors also argued Delgado’s motion for a venue change is “untimely,” because not only has he not been formally indicted on the bribery charges, but he also waived any preliminary examination/probable cause hearings based on the criminal complaint. This came after the court granted Delgado a bond during his initial appearance before U.S. Magistrate J. Scott Hacker. Based on those arguments, the government requests that the court strike Delgado’s motion for a venue change. Delgado faces a maximum of 10 years in prison if convicted and has yet to return to the bench since his arrest in early February. The court has not responded to the substitution motion nor the venue change motion, court records show.